What’s the Isabella’s Unbeaten Tracks? The “Trailing Isabella Bird Association” was established in May 2007 to see if what she used to see, hear and interested in are still remain unchanged today. Isabella Bird was the British woman who visited Japan shortly after the opening of Japan in 1878 (or Meiji 11). She walked all the way from Tohoku to Hokkaido, where there were no railway at that time. Then, she furthered to Muroran, Shiraoi and Biratori of Hokkaido and introduced the weather and the life of people in her book, “Unbeaten Tracks in Japan”. What did she see and experience in her journey? By tracing Bird’s footprint, we can see and retrospect Hokkaido’s history and scenery when Bird visited Japan. Our association trails Bird’s journey and identify the changes of the area she visited with an aim in mind, which is to revitalize the region by creating attractive areas for the purpose of eco-tourism. We created this footpath in order to convey Hokkaido’s history and natural environment to the people today and to revitalize the local region. In addition, we set up information board to convey the history of the locations where Bird visited with the help of local people from Nanae Town, Mori Town, Shiraoi Town, Hidaka Town and Biratori Town. You can see the footpath course we designed on the map in the link below, together with some local photographs and commentaries. 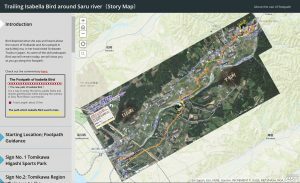 Are you not interested to see how is the Saru River Basin, which Bird had made it as her final destination in Hokkaido, looks like? The Isabella Bird’s 140th Anniversary Symposium was held. We will hold the Isabella Bird’s 140th Anniversary Symposium! 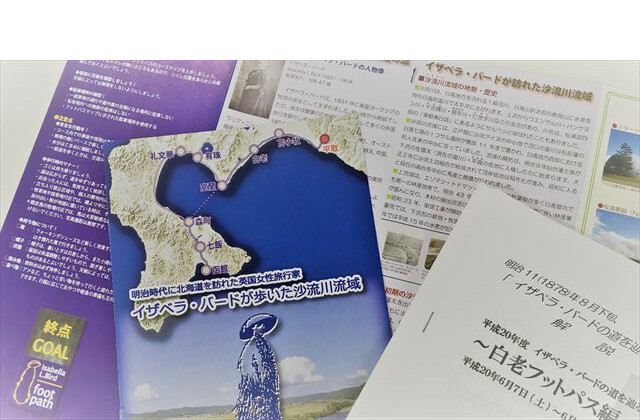 Hokkaido newspaper (Hidaka version) introduced Isabellabad’s story map. Copyright©2017 Trailing Isabella Bird Association All rights reserved.